The Fulton Music Association (FMA), presented the 2012 Senior Music Awards at the 15th Celebration of Community Music concert on Sat., May 19, it was announced by Steve Chirello, FMA president. 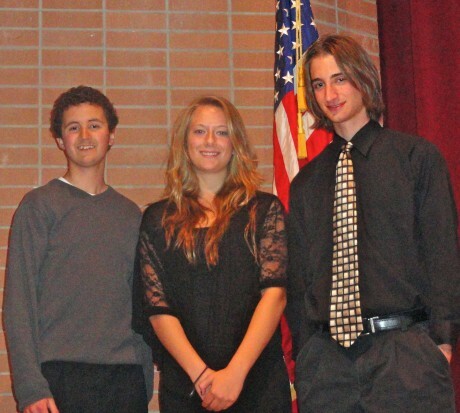 G. Ray Bodley High School seniors Nathan Deavers (far left) and Nicholas Abelgore each received a $500 Outstanding Senior Music Award. Dallaslyn Lamb received a $300 Special Achievement in Music Award. Deavers, an accomplished vocalist, will attend SUNY Brockport this fall where he plans to pursue a degree in Business Administration. Abelgore, who is proficient on trombone, piano and guitar, will attend Syracuse University where he will major in Music Performance. Lamb, a cellist, will attend the Rochester Institute of Technology (RIT), where she will major in film and video production. The FMA also helps sponsor Fulton’s summer concert series, Chirello said. FMA annually brings special performances to Fulton by the U.S. Army’s 10th Mountain Div. Band and cooperative programs with SUNY Oswego as part of its ongoing activities.